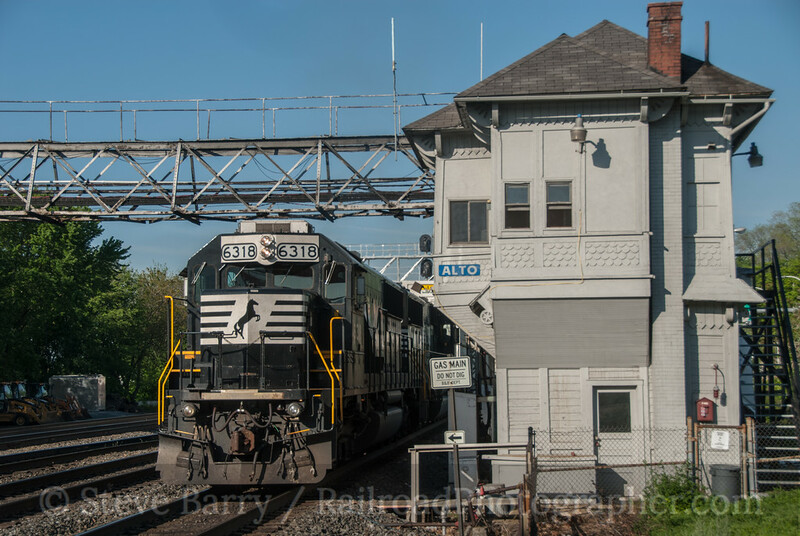 The end is near for a Pennsylvania Railroad icon. Alto Tower in Altoona, Pa., has watched the passing parade of freight and passenger trains since it opened in 1880. It has seen trains from Pennsy successors Penn Central, Conrail and Norfolk Southern pass it windows, and watched as the Penn Central's passenger trains gave way to Amtrak in 1971. Modernization of railroad signaling systems across the country, accelerated by the mandate to have Positive Train Control installed on all main lines by 2015, has caused the wholesale replacement of classic signal structures throughout the U.S. Alto Tower has been swept up in that same modernization. 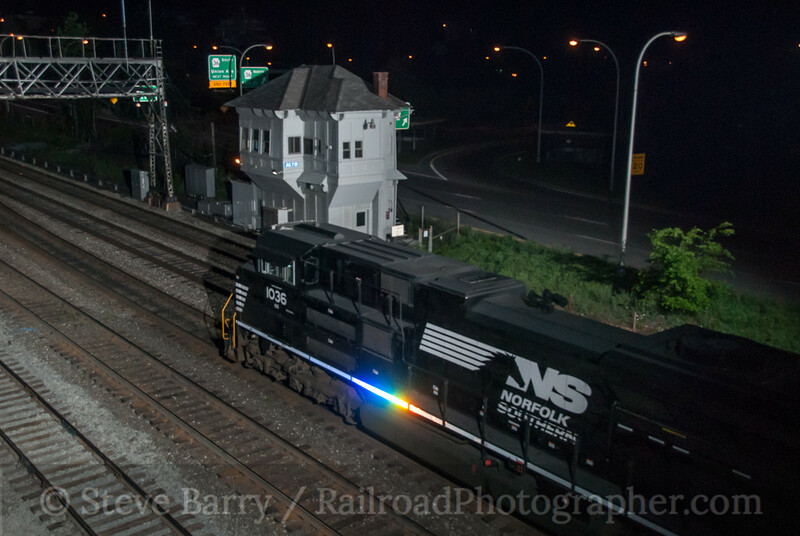 Long controlling the switches used to shuttle helper locomotives onto trains heading for the climb up the Allegheny Mountains, with the trains guided by classic PRR position light signals, the tower's functions will be shifted to a centralized dispatcher. With rumors swirling that the tower would be closed down in mid-May 2012, I headed out to Altoona for one final photography session of the tower. Late in the night of May 11, I was set up on the 17th Street bridge to photograph freights and helper sets as they paraded by the tower. The final shots were clicked off at 3:00 a.m. in the morning of May 12. After a quick nap in the car, I was back at the tower shortly after sunrise to get some last daylight shots. If there is any consolation to the story, the tower is expected to be left standing intact for the foreseeable future. It's location -- sandwiched between a four-lane highway and the railroad -- would make public access (and thus a museum effort) difficult where it stands. Perhaps it could be moved to the nearby Railroaders' Memorial Museum or even just across the tracks where there is available open space. Towers once dotted the entire Pennsylvania every few miles. Indeed, Alto had sisters within eyesight in either direction. But Alto became the last, and it will soon join the others as a piece of history. 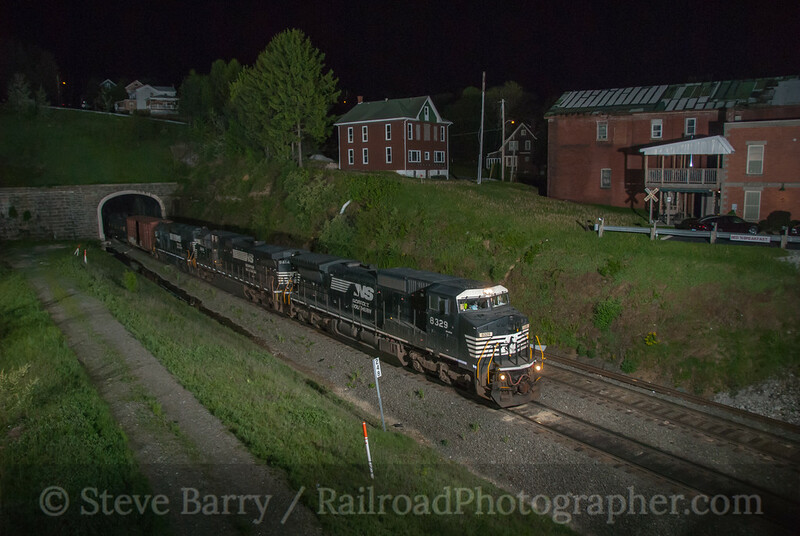 Bonus Shot -- before shooting Alto Tower on May 11, I headed up to Gallitzin to see if my flash equipment could light up trains exiting the tunnel at the summit of the Alleghenies. The photo below was taken with four strobes. Yeah, it's May 2012 but there is still some neat stuff from 2011 we wanted to bring you. Enjoy this vignette from Colorado that occurred in September 2011. Denver & Rio Grande Western K-36 class 2-8-2 No. 485 fell into the turntable pit in Salida, Colo., and was subsequently scrapped in 1955. It is the only one of the Rio Grande's ten K-36s to be scrapped; the other nine have found homes on the Cumbres & Toltec Scenic Railroad and the Durango & Silverton Narrow Gauge Railroad. So how could No. 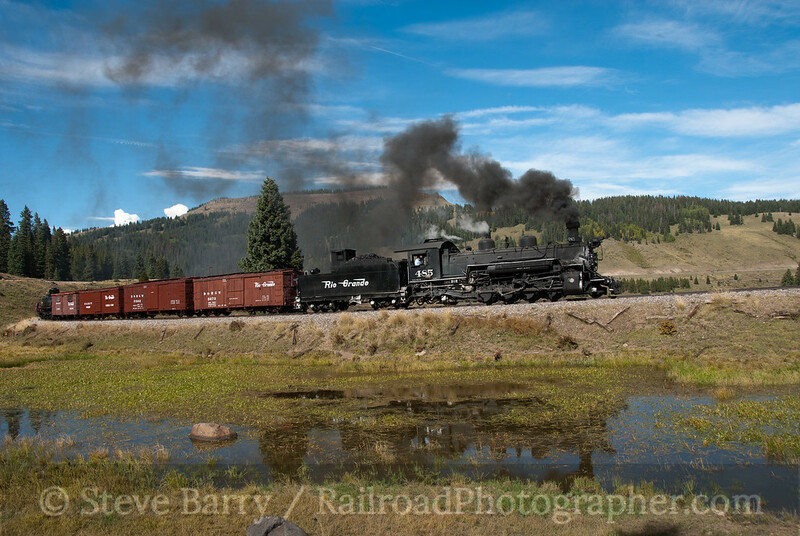 485 be working its way from Chama, N.M., to Cumbres Pass, Colo., on September 21, 2011? 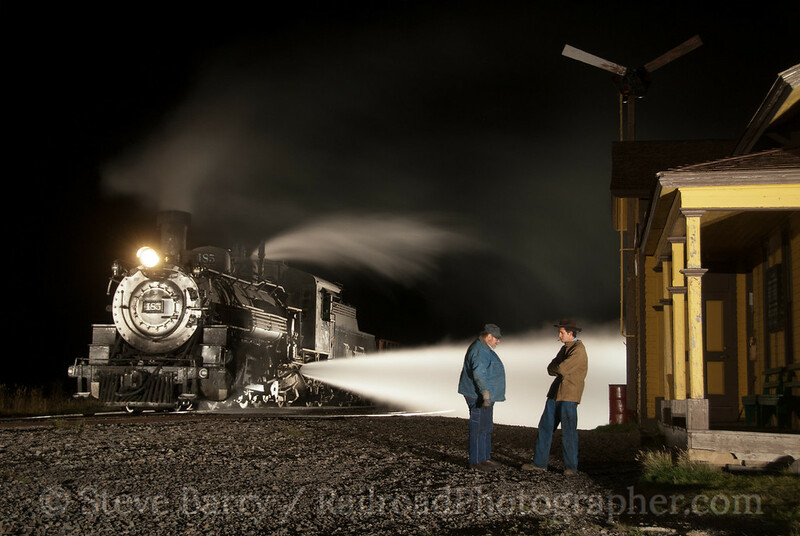 The answer starts the previous night, September 20, in the shop of the Cumbres & Toltec Scenic. 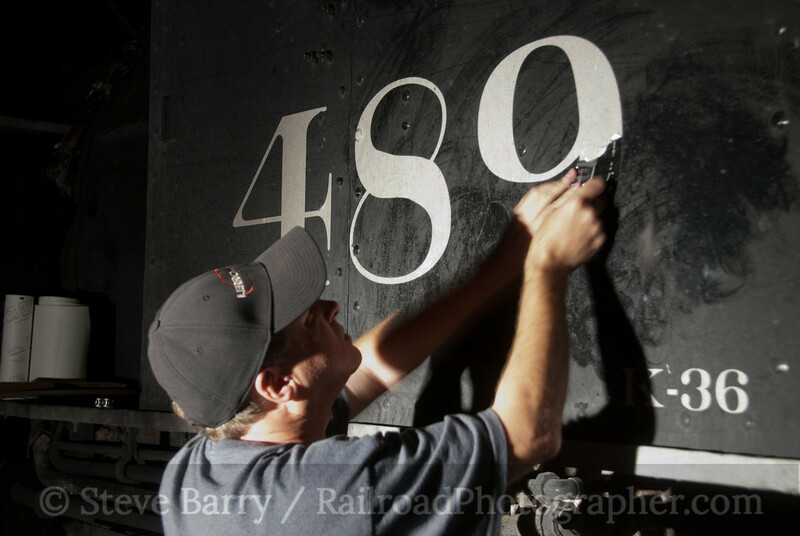 In preparation for a photo charter, Pete Lerro of Lerro Productions and his team are scraping numbers off the side of K-36 No. 489 and swapping out number boards. The C&TS has filed paperwork with the Federal Railroad Administration for a number reassignment, and the result is D&RGW No. 485 is once again an official locomotive. The new vinyl "5" on the sides of the reincarnated 485 were a bit too white, but a little soot from the ground outside the shop and a bit of elbow grease soon disguised the new digit. The next morning No. 485 was on the point of a freight train ready to make its way up the four percent grade to the 10,000-foot summit of Cumbres Pass. D&RGW No. 485 outside Chama, N.M.
For the first part of the Lerro Productions charter the photo line followed along in cars, with the train lowing down occasionally to let photographers get ahead. One of the better locations was the S-curve along Highway 18 as the train worked its way through the hills outside of Chama (above). Upon arrival at Cumbres Pass, the chasers became riders, boarding the train to head for Tanglefoot Curve, a signature location on the Colorado narrow gauge circle (below). D&RGW No. 485; Tanglefoot Curve, Cumbres, Colo. 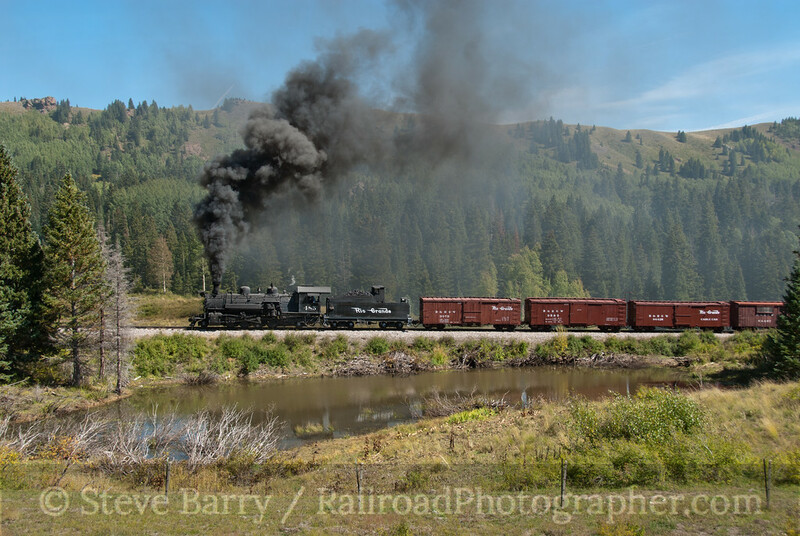 The train pushed back to Cumbres Pass from Tanglefoot Curve and turned on the wye at the summit, where a few runbys were held just at sunset. 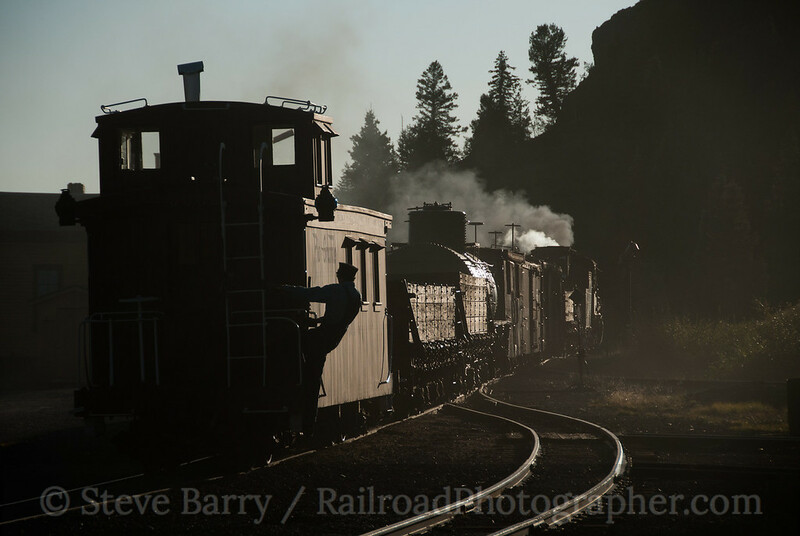 The setting sun along with the smoke and steam in the thin mountain air made for a moody narrow gauge scene right out of the 1950s (below). Sunset at Cumbres Pass, Colo.
Up next was a night photo session at the summit, with No. 485 providing a lot of steam to the assembled photo line (below). Several different angles were available. The crew provided a steamy blowdown to add contrast to the scene. 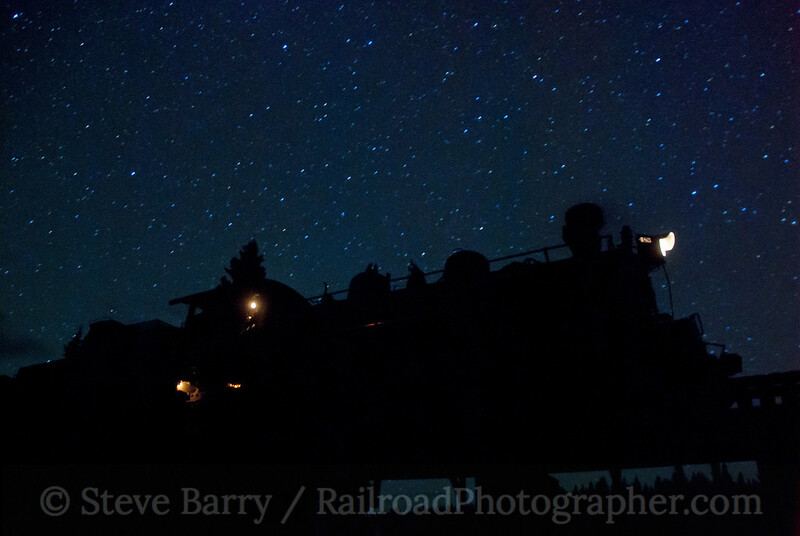 Night on the narrow gauge at Cumbres Pass, Colo. The final shots of No. 485 would be under a blanket of stars at the summit (below). The photographers would return to their cars to drive back to Chama, while the crew would bring No. 485 down the hill in darkness. No. 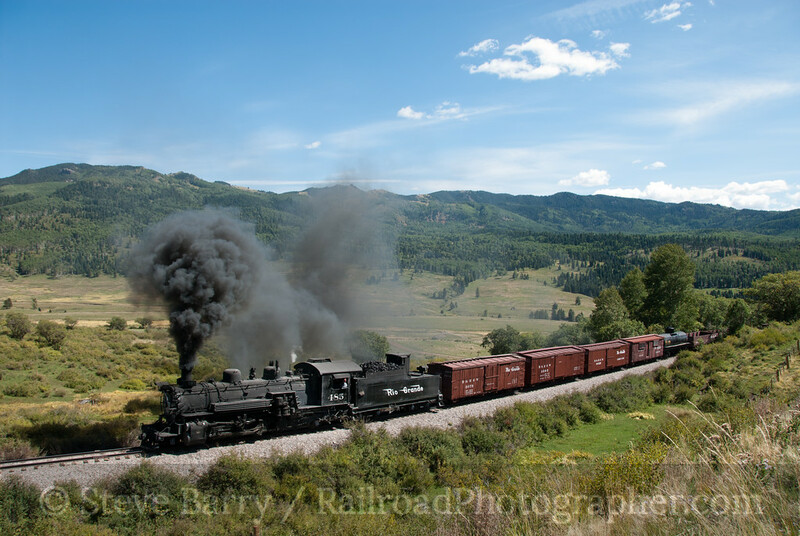 485 would power regular trains on the Cumbres & Toltec Scenic on September 22, but the following day a "9" would be applied to each side of the cab and No. 485 would once again vanish into the pages of history. We're still working through a backlog of photos on the website, so while we catch up we'll look at some golden semi-oldies. We'll head back to June of last year for this post. Sounder is the commuter railroad operated by Sound Transit (which also operates streetcars and light rail) in the Seattle area. 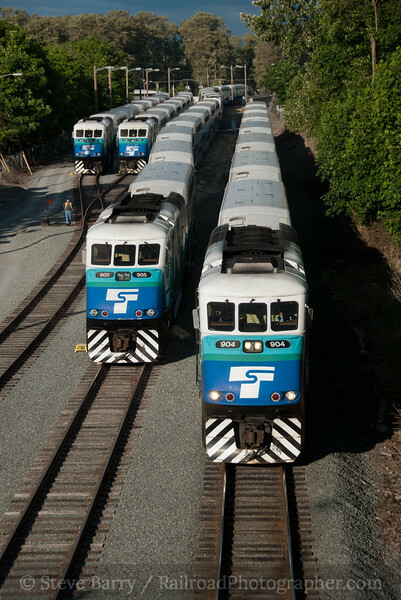 With lines both north and south out of Seattle, Sounder has numerous trains every weekday. 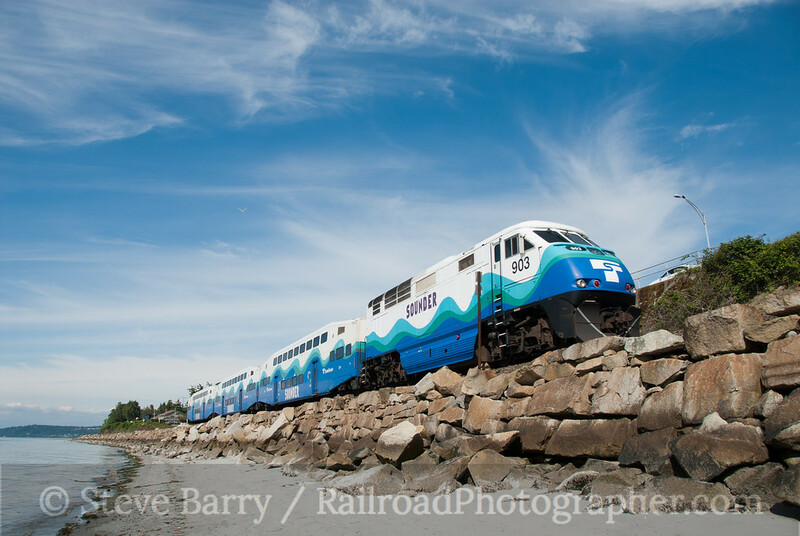 And Sounder is one of the most scenic commuter lines in the United States, with running along Puget Sound north of Seattle (such as above at Edmonds) and vistas of Mount Rainier to the south. 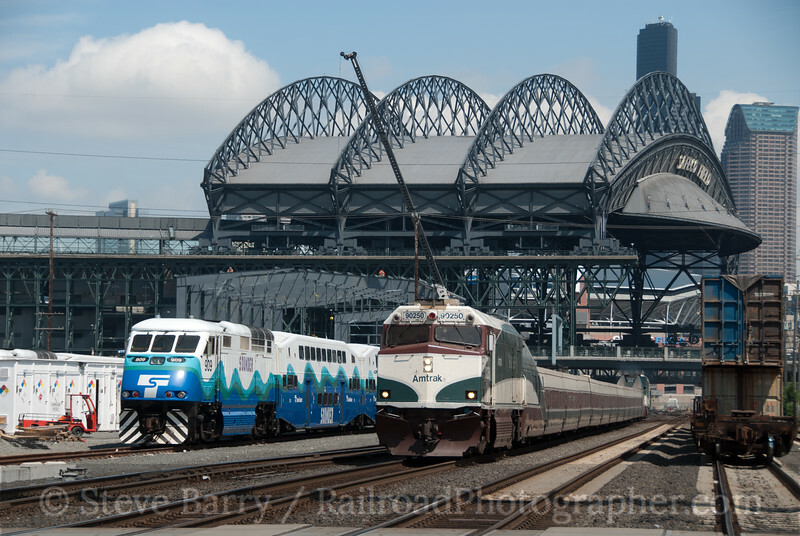 We'll take a tour of Sounder from Everett through Seattle to Tacoma. We'll start our tour at the line's north end in Everett. 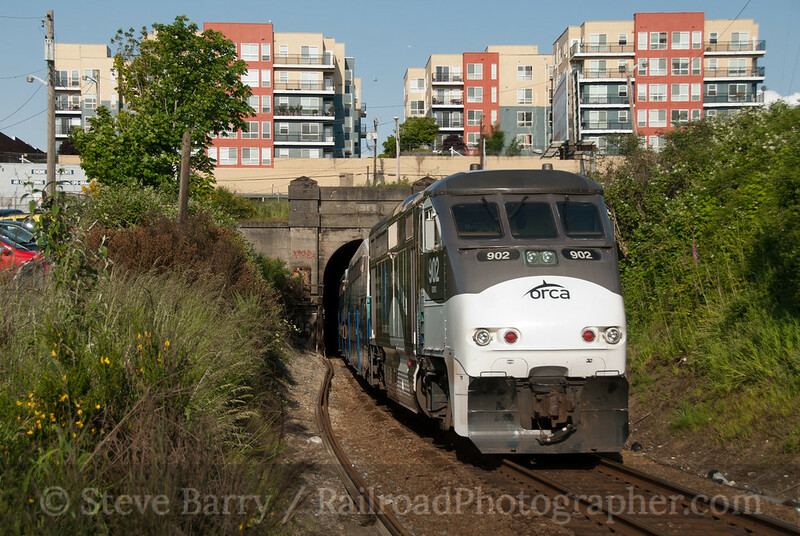 Sounder operates over BNSF trackage, and in Everett we find a tunnel under the town. F59PHI is pushing a northbound train into the tunnel. ORCA is a fare card for transportation on all Sound Transit rail and bus lines. The tunnel opened in 1900 as part of the Great Northern. 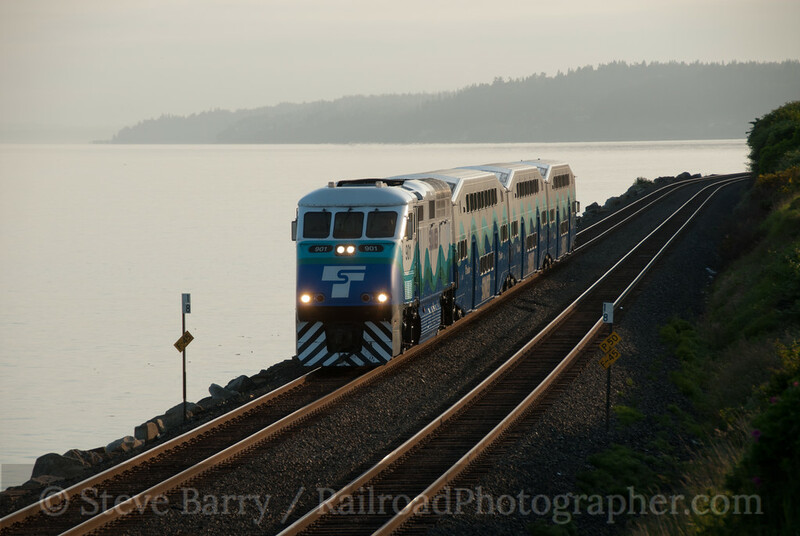 One of the most scenic locations on the Sounder system is at Edmonds, where the railroad hugs Puget Sound. The yellow signs along the tracks indicate the speed limit of 45 m.p.h. 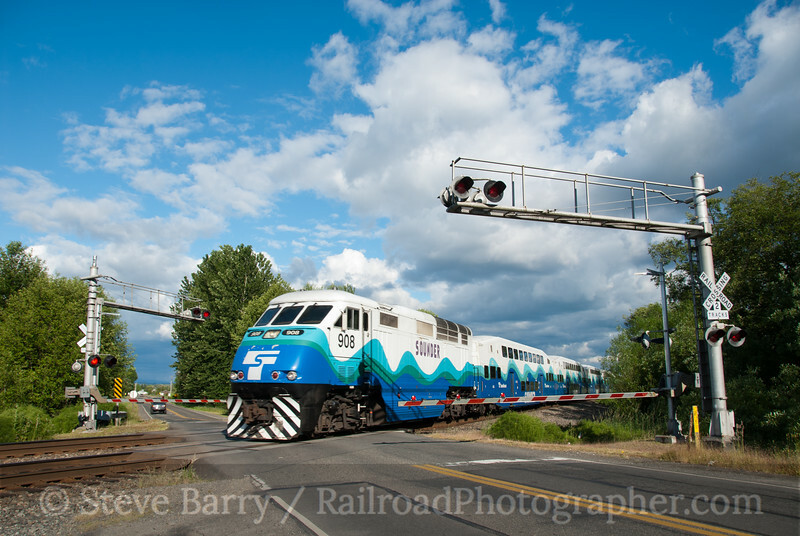 for northbound BNSF freights, while Sounder (and Amtrak) are allowed 50 m.p.h. 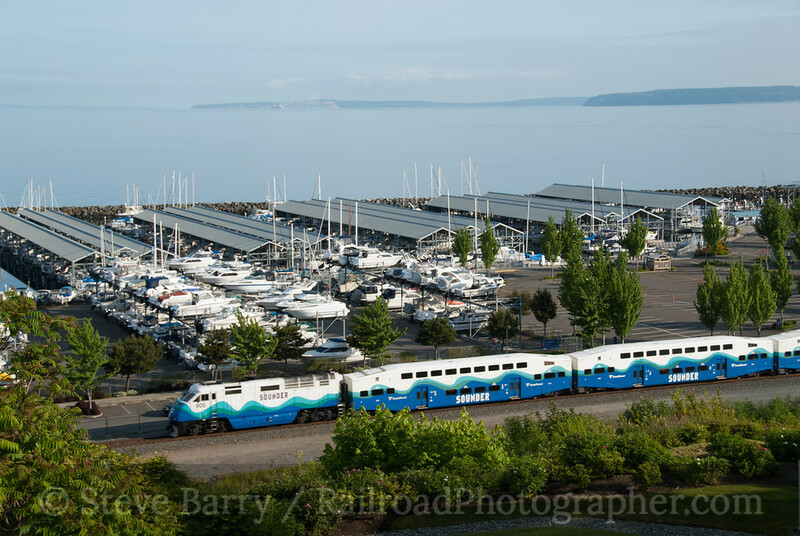 South of the station in Edmonds we see a northbound train being pushed as it passes a marina. Edmonds is also the home to Washington State Ferry service to Kingston. King Street Station is at the south end of a tunnel under Seattle. The ORCA locomotive, No. 902, is pushing an Everett-bound train into the tunnel as it leaves the station. King Street Station was opened in 1906, serving the Great Northern and Northern Pacific. "Modernized" in the mid-20th century, King Street Station is undergoing a restoration to remove much of the modernization (such as drop ceilings), restoring it to its as-built grandeur. It's a pleasant day for Mariners baseball, so the retractable roof over Safeco Field is open and hanging over the tracks shared by Amtrak and Sounder just south of King Street Station. Amtrak NPCU No. 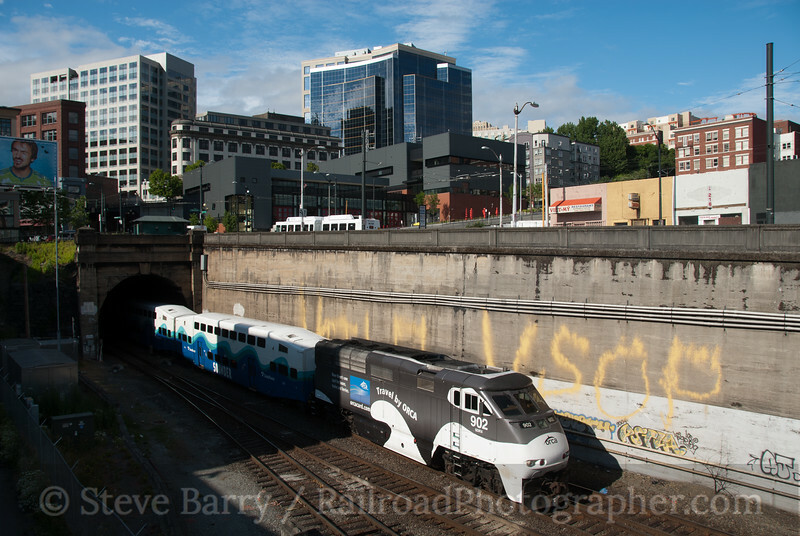 90250 leads a Cascades train past the servicing yard for Sound Transit. Visible under the roof is Qwest Field (since renamed CenturyLink Field), home the NFL Seahawks. South of Seattle, Sounder serves Tacoma. Just minutes from the end of the line, F59PHI No. 908 leads a train across 52nd Street in Waller. From the same grade crossing at 52nd Street we get this magnificent view of Mount Rainier. At 14,411 feet in altitude, Mount Rainier is the most topographically prominent mountain in the lower 48 states, and is considered one of the most dangerous volcanoes in the world. terminus in Tacoma. F59PHI No. 904 will shortly lead its train along a long wooden trestle on former Milwaukee Road trackage and arrive in the Tacoma station (itself a converted Milwaukee Road freight house). After unloading, No. 904 will join Nos. 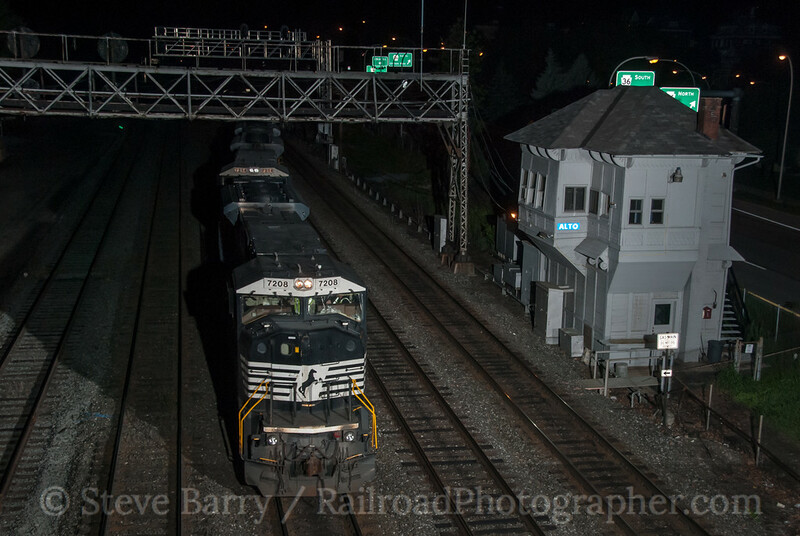 905, 908 and 906 in the yard for the night. As you can see, Sounder is a modern -- and scenic -- commuter railroad. It's well worth a visit if you are in the Pacific Northwest. 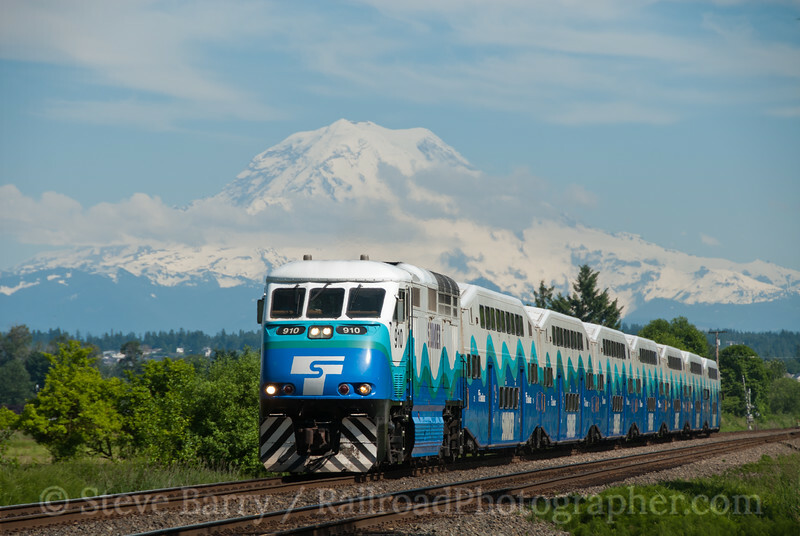 And while we're here, how about a plug -- the shot of Mount Rainier (above) is one of my favorite photos from last year and I selected it for the cover of my Trackside Travelogue 2011 book. The book is 240 pages on high quality paper, sized 10x8 (horizontal format), with one photo per page. For more details on the book, head on over to our bookstore. You can preview the entire book and get ordering information. We're bringing the blog back to life, and we'll start with a borderline golden oldie. We'll go back to last September to get things started. 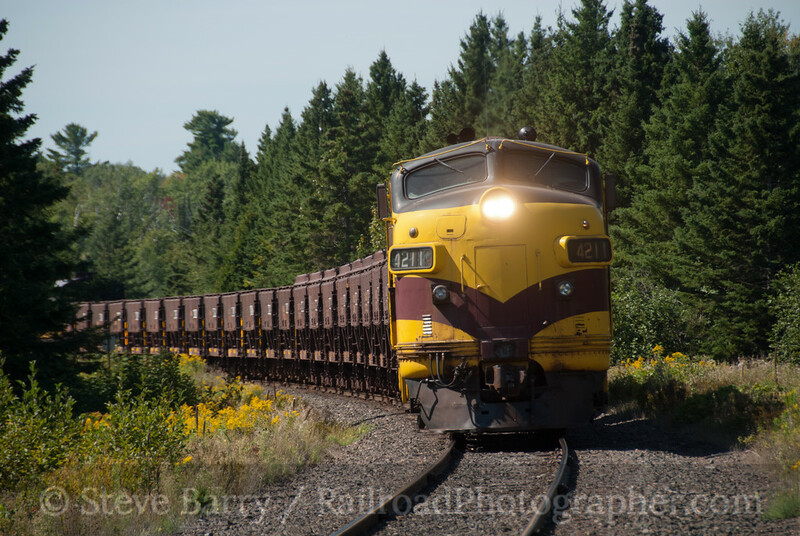 One of the great railroading regions in North America is the Iron Range of northern Minnesota. When I first visited the area in the early 1990s the big attraction were the EMD F-units operating on Erie Mining's railroad from the ore fields to Lake Superior at Taconite Harbor. Alas, my one trip to the railroad while it was running resulted in one day of photography with the railroad quiet on the rest of the days of the trip. 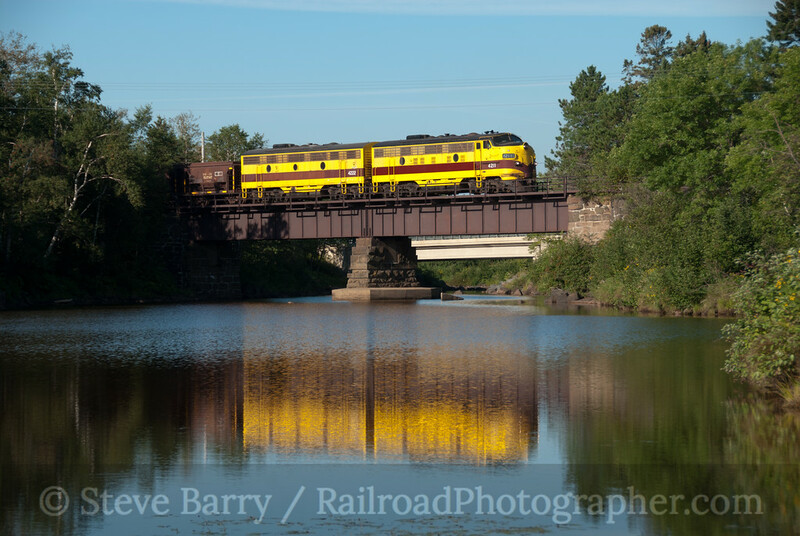 Most time was spent on the "other" railroad, the Duluth, Missabe & Iron Range. After Erie Mining stopped running its railroad in 2001, subsequent trips found more time spent on the DM&IR, which emerged as a pretty cool railroad in its own right after emerging from the shadow of Erie Mining. Time marches on, however, and the DM&IR was soon sold to Canadian National in 2004 and the slow process of assimilation started. The Missabe's attractive locomotives were retired or painted into CN colors, and by the latter part of the first decade of the 21st century there was very little of the Missabe identity still visible. 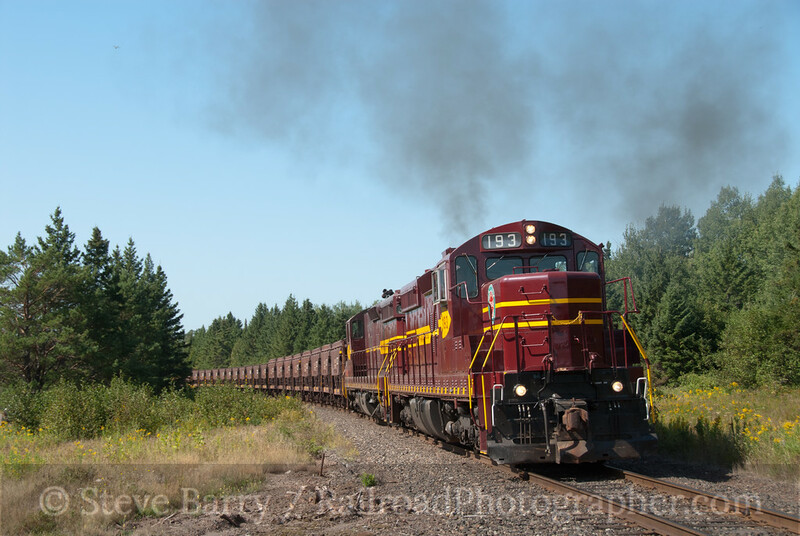 In September 2011 the Lake Superior Railroad Museum of Duluth operated a weekend that brought back the Iron Range of the 1990s. Over two days the museum would operate ore trains (using cars graciously loaned by Canadian National), one day using the museum's Erie Mining F-units on Saturday, September 10, and the museum's DM&IR SD18 No. 193 and SD-M No. 316 from the Missabe Railroad Historical Society on Sunday the 11th. 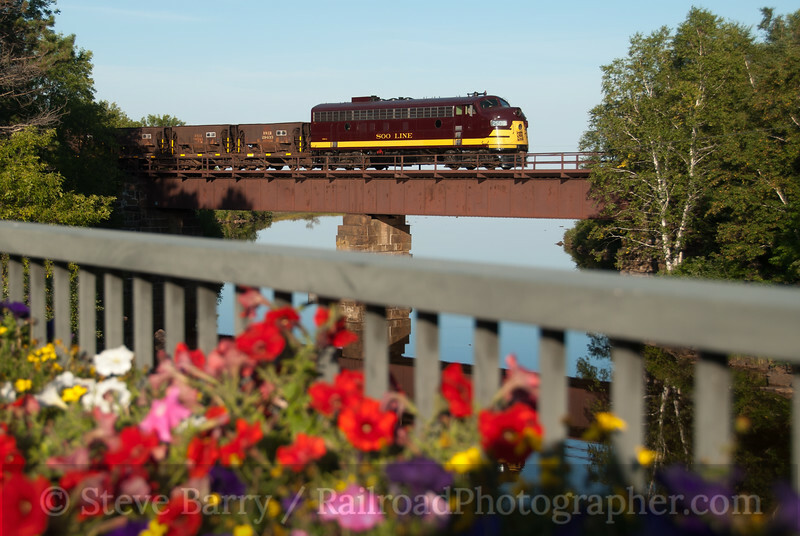 The trip would operate on the North Shore Scenic, a former DM&IR line between Duluth and Two Harbors, Minn., operated by the museum. North Shore Scenic; Knife River, Minn. 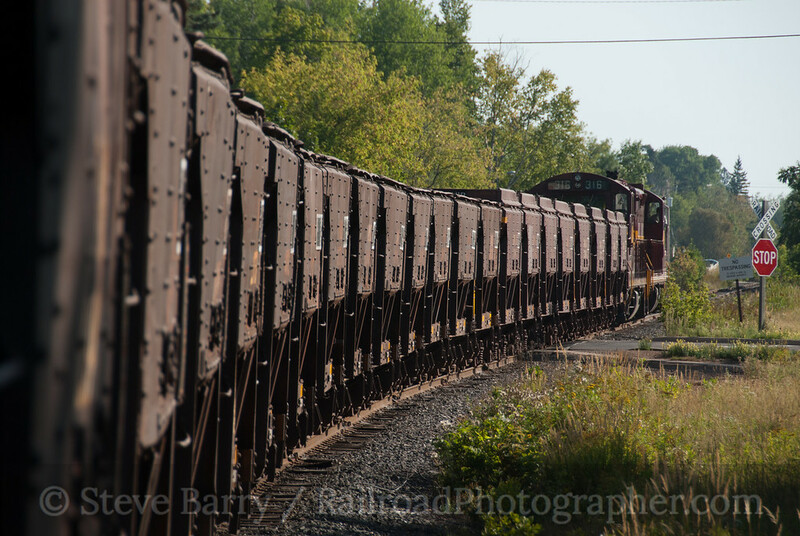 The photo freight train had the aforementioned Erie Mining F-units on the north end of the train. On the south end was the museum's Soo Line F7 No. 2500. The result gave the appearance of two different ore trains from two different railroads, depending on which end you were shooting. 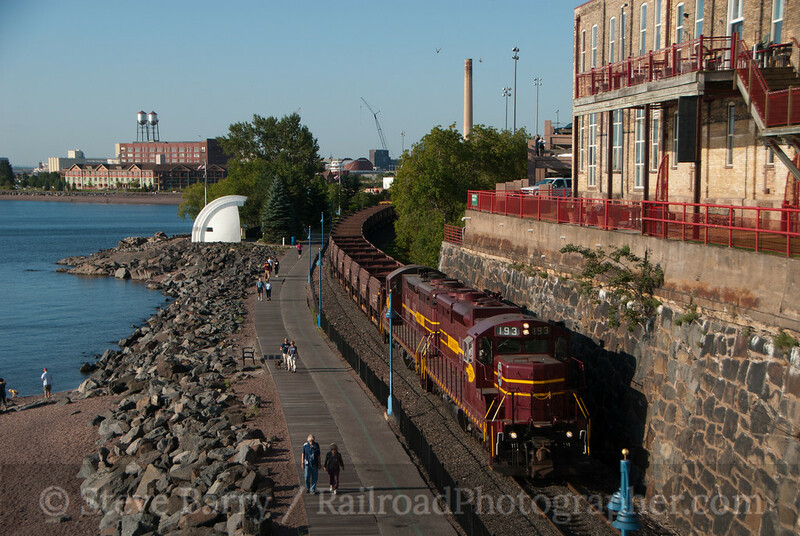 Passengers were shuffled between photo locations in a passenger train led by Duluth, South Shore & Atlantic RS1 No. 101, owned by the DSS&A Division of the Soo Line Historical & Technical Society (and kept at the museum in Duluth). Photo stops were arranged by Steve Glischinski, who picked stops based on sun angles, utilizing many of the several bridges located on the scenic branch line. The bridge at Knife River provided bookends to a productive day, starting with the Erie Mining units posed on the bridge (top photo) and finishing with Soo Line No. 2500 posing with flowers (above). The grand finale was DSS&A No. 101 with a near-perfect reflection, put to an end when two kayakers paddled through the reflection as the photo stop was wrapping up (right). At least the kayakers had kayaks in DSS&A colors! All in all, it was a fine day. The next day the Missabe had the spotlight as the 193 and 316 shared the spotlight on the ore train. The first photo stop of the day was in downtown Duluth at Fitger's, an old brewery along the waterfront. On this day passengers rode in a caboose at the rear of the ore train. Plenty of opportunities were provided on the many curves on the branch line to get a brakeman's view ahead. The two Missabe veterans put on a spirited show, bringing back some great scenes of the way it was (even if the "good old days" in this instance were only about a decade ago). 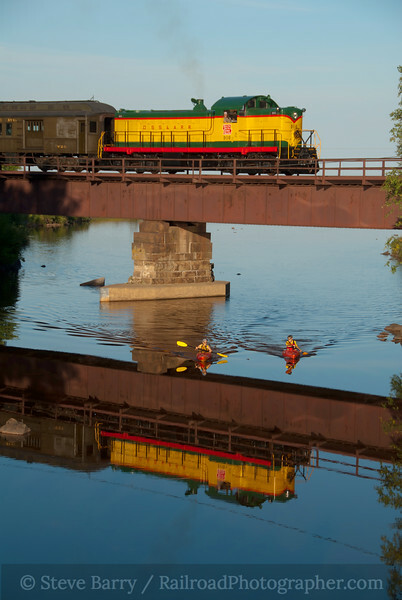 Soon the train returned to Duluth, putting an end to "old school Missabe."